Every year we see a variety of engagement ring trends step into the spotlight and take centre stage – and this can make it seem even more overwhelming when you’re looking for the perfect piece! However, we’re here to help. We’re experts when it comes to engagement rings and we’ve gathered together the top trends that you’ll be seeing more and more of throughout 2019! Coloured stones are perfect for those looking for a unique engagement ring that represents their personality. The vibrant stones are a stunning way to inject a touch individual style and have been a hit with celebrities and royals alike! Sapphires are an ideal choice when looking for coloured gemstones as they are durable enough for every day wear, but also beautifully vibrant and come in many colours. 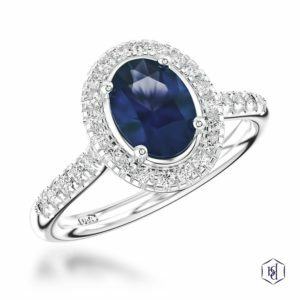 The PLATINUM 0.93CT OVAL CUT SAPPHIRE RING uses a halo design to accentuate the centre gemstone, creating a enchanting look. Coloured diamonds are also one to look out for in 2019. 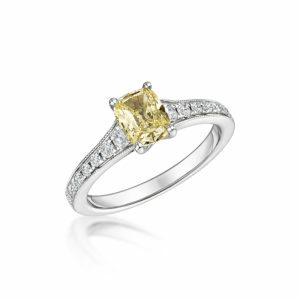 Yellow diamonds have the same captivating sparkle of a white diamond, but the pop of colour adds a unique and special twist to a classic style. This 18CT WHITE GOLD 0.74CT CUSHION CUT YELLOW DIAMOND RING has a four claw setting to allow the optimum amount of light to flood through the diamond, perfectly accentuating its sunny hue. If you want to incorporate gemstones into your look but don’t want to part with the classic diamond engagement ring, another popular trend in 2019 is coloured eternity rings. The vibrancy of the gemstones beautifully complement the brilliance of the white diamonds and look amazing when worn with a diamond ring, or even as an engagement ring itself. 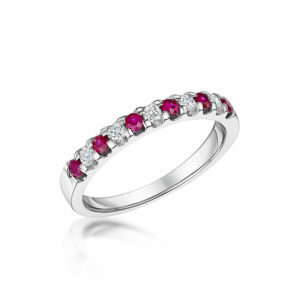 The 18CT WHITE GOLD 0.33CT RUBY AND DIAMOND HALF ETERNITY RING is a really stunning piece that could help you to create a unique and special style. Yellow gold is definitely making a comeback in 2019! At one point yellow gold seemed to be losing its appeal, however in recent years the timeless choice has seen a revival and this year it will be firmly back in fashion. 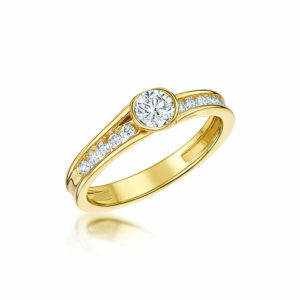 As yellow gold has been seen as a more traditional metal it really lends itself to classic styles of engagement rings. A solitaire style in yellow gold is a truly timeless choice and the YELLOW GOLD PRINCESS CUT DIAMOND RING is a beautiful and elegant ring. The warmth of the gold contrasts beautifully with the 0.70ct white diamond, emphasising its sparkle. Although it is seen as a traditional choice the growing popularity of yellow gold has meant that the metal has been worked into an array of glittering designs. There is now a beautiful range of yellow gold designs that are a twist on the classic solitaire. The 18CT YELLOW GOLD 0.50CT BRILLIANT CUT DIAMOND RING has a really distinct style. The centre diamond is framed by a rub-over setting and it’s finished with glittering channel set diamond shoulders. A wonderful new look for the timeless metal. If you’re not sure of going for a full yellow gold look our Diamond by Appointment range has a collection of exquisite pieces that incorporates both platinum and yellow gold to create a contrasting halo design. 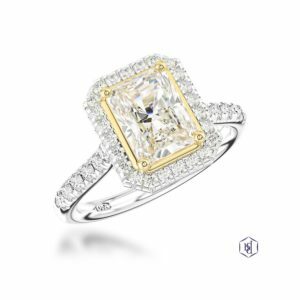 The PLATINUM & 18CT YELLOW GOLD 0.41CT RADIANT CUT DIAMOND features a stunning diamond that’s set in luxurious yellow gold. It gives the ring a really indulgent feel, as well as enhancing the stones golden hues. In 2019 will see brides to be looking for more intricate and detailed designs. More and more people are looking for individual styles that stand-out and reflect their personality. After all every love story is unique and should your engagement ring should be too. An elaborate twist design creates a unique and eye-catching look, that’s both glamorous and elegant. 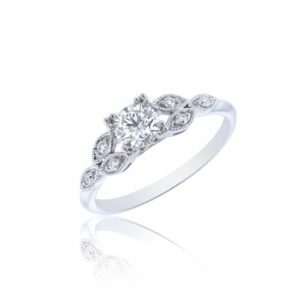 The striking PLATINUM 0.70CT BRILLIANT CUT DIAMOND RING incorporates a twisted band style adorned with dazzling diamonds. It gently sweeps towards the centre and frames the breath-taking diamond in a really unusual way that’s both distinct and sparkling. One way to add more of an individual look to your engagement ring is to take a classic style and add a little twist to it. The trilogy ring is a style that has been loved for generations and the three stones represent your past, present and future together. Traditionally these would be three round stones, however the PLATINUM 0.43CT OVAL CUT DIAMOND RING mixes this up with a stunning oval cut diamond flanked by two pear shaped stones tapering out to the band. A new look for a much-loved classic. 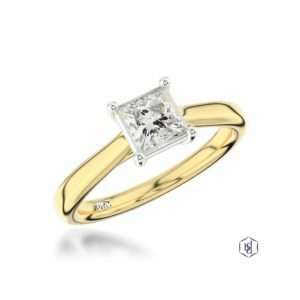 An engagement ring should capture your personal style and there are a range of rings out there that have unique touches to complement any tastes. This 18CT WHITE GOLD 0.51CT BRILLIANT CUT DIAMOND RING is a magical way to show off your personal style. The delicate, floral-inspired design has an almost vintage appeal and is perfect if you’re looking for something that’s got its own charm. 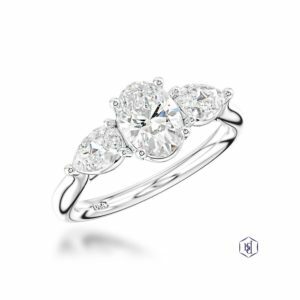 The Halo Ring is a classic, elegant style and is here to stay in 2019. The beautiful setting features a ring of smaller, sparkling diamonds surrounding the centre stone, adding a luxurious and glamorous touch to any engagement ring. 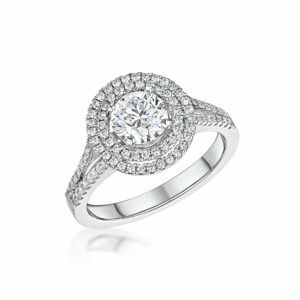 The halo is a simple design feature that really helps your ring to stand-out. In this 18CT WHITE GOLD 0.50CT BRILLIANT CUT DIAMOND RING the enchanting centre diamond is framed by a halo, drawing your eye to it wonderfully. Set on a simple band it creates a modern and luxurious look that you’re bound to fall in love with. 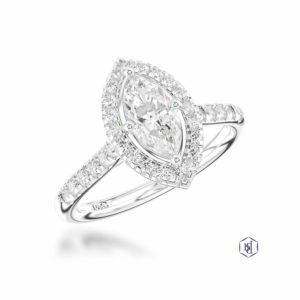 A halo design looks spectacular on a fancy cut diamond, really helping to enhance its eye-catching shape. This PLATINUM 0.54CT MARQUISE CUT DIAMOND RING is a really striking piece that’s bound to turn heads. The glittering halo frames the distinct marquise cut, whilst the diamond adorned band adds an extra touch of luxury. For extra ‘wow’ a double halo can really make an impact. 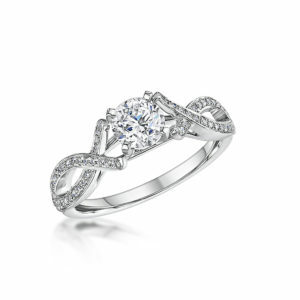 The PLATINUM 0.91CT BRILLIANT CUT DIAMOND RING exudes breath-taking glamour. 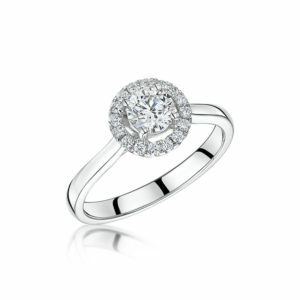 The double-row halo is truly dazzling, only adding to the sparkle of the centre stone. More diamonds elegantly line the shoulders and a truly magnificent ring is created. Thank you for taking the time to read our guide to Engagement Ring Trends in 2019! Follow our latest news on Twitter, Facebook, Instagram, YouTube and Pinterest, or if you have any questions please pop us an email at info@laingsuk.com.